These plastic Finger Castanets are colorful, safe, fun and great sounding! Once you get the hang of holding these in your upturned palms and snapping them shut with your fingers, you’ll have a hard time putting them down. 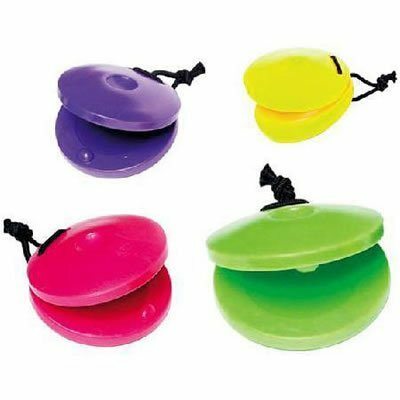 ; From the Manufacturer; Plastic snapping castanets in assorted colors come packaged in an attractive 36 piece retail display box. I bought 6 pairs and I'm happy with them. I'm teaching my daughter (3.3 y.o.) rhythm and she enjoys making sounds with them. (She immediately learned the word, "castanet", too.) I use castanets for a circle time when I have playgroup/playdate for my daughter. I have an expensive set of musical instruments as well; but, you don't need to spend a lot of money to introduce music (rhythm) to toddlers. I take my daughter to a music class and learned that most toddlers enjoy simple musical instruments like castanets. Even after kids grow up you can still play the "Simon Said" rhythm game using the castanets. They are very affordable and great musical instruments.